Ever since Bioderma Crealine went stellar in blogging circles I have been using micellar water (there’s nothing like jumping on the beauty bandwagon.) I was sold on it by it’s promise of removing make-up without stripping your skin, so you could do a quick refresh if, for instance, you were planning to go out in the evening. The one thing I have noticed most about it is that it reminds me an awful lot of gold old-fashioned toner. 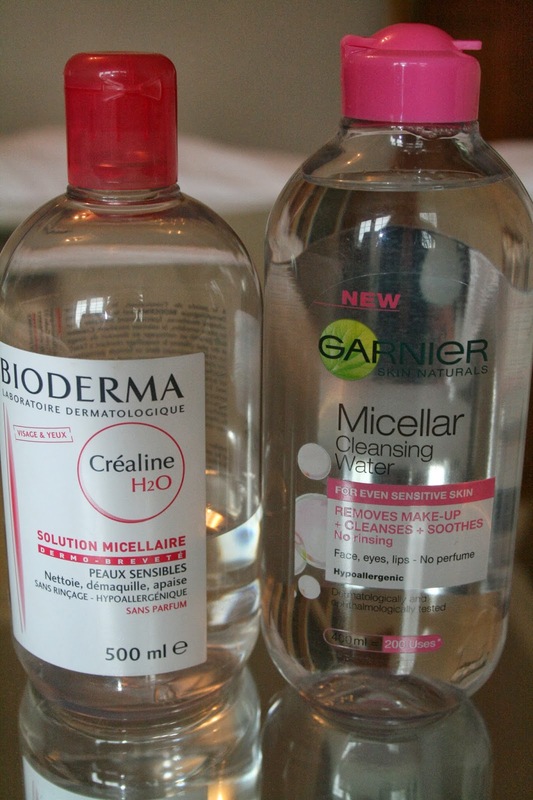 I was intrigued to find out how micellar water works and how that differs to plain toner. The old school remedy to a grubby face was soap, and micellar water works using the same principle. Soap works by being able to bridge the divide between oil (your mucky face) and water (where you want the muck to end up.) If you wash your face with just water it just slides about and comes off clean, if you add soap then the soap adheres to the dirt and the dirt can then be dissolved into the water and rinsed away. There is obviously more chemistry than that, which is all to do with charged bonds etc.. but I am trying not to bore you. Micellar water works by being like a very mild soap solution that can grab the dirt/make-up off of your face and then it keeps it in the micellar water and the cotton pad transports it away. Micellar water is much more mild than soap and most wash off cleansers but is still strong enough to remove waterproof make-up (debatable). I have tried Bioderma Crealine, Lancome’s and Garnier’s blatant rip-off and was very impressed with all of them. I don’t use them every day but when I need a quick make up change they are indispensable. I also use them to freshen my skin in a morning if I don’t feel (read too lazy) like a full face wash. I like Micellar waters as they don’t moisturise at all and with my oily skin, anything that reduces oil is fine by me. They are also great for travelling such as freshening up on a plane, though obviously you would need to decant into a travel size bottle. So how does micellar water differ from toner? From my extensive (cough cough) research I have ascertained that toner and micellar water are indeed a completely different animal. They may feel similar on the face but toners have many different uses none of which should be primary removal of makeup. So I can rest safe in the knowledge this is not just an old product repackaged. grrrrr.. annoying photo where bottle isn’t straight! There are many high end versions available but I think as always you are paying a premium for the advertising and branding, so my favourite would be the Bioderma Crealine, with the Garnier coming in a close second, it also has the advantage of easy availability, I have even seen it in supermarkets! I would say that they are, but they will always be slightly niche as they don’t give a through cleanse and are more useful to those of us with make-up obsessions than to the casual user. If you have any comment or questions feel free to ask down below. I try to always reply. I use micellar water too, usually from La Roche Posay, and I use it to get rid of that last bit of dirt and make-up that my cleanser might leave behind. I want to make sure that my skin is perfectly clean! That's a great idea, as I use wash off cleansers and there must always be a little residue left. This would be ideal as it doesn't leave your skin feeling stripped. I love my micellar water, I use L'Oreal, I use it as a make up remover and then after my cleanse before toner! I also use it when I am feeling *cough cough* lazy/rushed instead of a proper cleanse!